I fired the Manabigama this week with Amy Hand a local potter and ceramic sculptor. We preheated all night with gas and then kept the burners on until noon as we started building up heat and throwing wood in Sunday morning. After 17 hours of firing and having used less wood than we anticipated needing we hit a soft cone 12 & 13 up front with soft cone 10 in the middle and at the back wall near the flue on the floor. There were a few pieces with one particular flashing slip made and left by a previous instructor this fall that had no effect. Have any of you had issues with “Flashing Slip #1” in wood kilns before? ….. Anyhow I wanted to share some of my results. Every time I make work for a wood fire I generally fall back on to a few specific forms which relate to pieces and styles both historic and contemporary that I enjoy and draw inspiration from. The work is so different from the main body of work though that I have begun to question its relevance to what I do. Why make these pieces which don’t fit in with my work? I enjoy making them but dont feel that I can sell or show them. I tell myself from time to time that making this work, which I generally trade or give away, is a way of letting loose from the work I usually make or that it allows me to stretch another set of muscles and play. I also wonder if it is a way to connect with community which has always been one of the most important factors of ceramics to me personally. I love the group effort that goes into these firings and being there as part of a team when things are going poorly or amazingly well. I’m still thinking about this and at the same time trying to find ways to pull woodfiring back into my current body of work. I just read this article from Janet DeBoos about here experiences in working with industry and dealing with the production of her work on an industrial scale. There are some good tidbits for us makers to chew over in here on what handmade and functionality as we see it from a ceramic [potters] perspective actually means. I did enjoy the questioning of the ritual of an object and what do those older rituals mean in this day and age. I know that many of us, myself not excluded, are frequently writing and re-writing our statements and I had to chuckle to myself a little as I made my way though the section on the way we as potters and makers perceive the aspects of touch and making in out work before quickly feeling shameful for taking such a narrow perspective on making. Anyhow, you read it….. The importance of the role of the hand is generally assumed when one reads articles and artist statements about domestic ceramics. Most often this takes the form of references to touch, the accumulated histories of use that reside in functional objects, and the mark of the hand in making. In a practice that has spanned thirty years of throwing pots this has seemed central to my working life. But the ready assumption of this importance has always troubled me – especially as one sees more and more of those ‘motherhood’ statements about handmade pottery and the ‘touch’ of the maker. The same goes for statements about the ‘rituals’ of use, with no apparent consideration of just what those rituals are today, and whether indeed we have any. Coming from a science training probably increases any doubts that niggle away in my mind. What does all this ‘handmade’ stuff mean? Can the validity of those beliefs be tested in any way (keeping in mind that beliefs are what we have in the absence of evidence…)? Could ‘handmade’ be just a look? And ‘rituals’ just a marketing idea? In a different way, the question of ‘design’ keeps rearing its head and causing problems of definition and practice. Think of design, and you think of CAD programs, RAM pressing, industrial slipcasting and you are compelled to think of a certain sameness of outcomes in those functional ceramics that have been produced so far using these technologies. They never look handmade. Now this sameness may be as a result of following of fashions of new modernism, or it may be that the level of sophistication of the programs and their use is such that getting the qualities of the ‘handmade’ into the work is too difficult. Over the past three years I have had the opportunity to be engaged in projects that tested these assumptions, working on a null hypothesis that proposes that there is NO difference between studio produced handmade objects and factory produced objects that just ‘look’ handmade. The first opportunity came about when my agent Karen O’Cleary (Narek Galleries, Tanja) took my work to SOFA art fair in Chicago. Aldo Cibic (original member of MEMPHIS design, Italy, but now with his own design company) saw my work during a break from his duties as keynote speaker at a furniture conference on at the same time. He asked if his company’s ceramics offshoot, Paola C ceramics, could produce my ‘concepts’ (Cibic’s words) for their showroom in Milan. “Yes” was my reply after an indecently short time to consider the implications, but with a sense that this was a good start to testing my hypothesis. and understanding of porcelain, he wanted to keep production in Italy. I had no input into the making process at all as the company had bought the ‘models’ and the rights to produce them for five years. The resulting works are now on their website, have been taken to design and ‘objects for the home’ fairs in Paris and Milan, but are selling slowly because they are very expensive compared to the prices of most Italian ceramic production. The quality is excellent, and I find it hard to tell that they are slipcast. Colleagues who have seen and handled the ware think it is part of my production until told the awful (wonderful?) truth. What does this mean? The second opportunity came about when I was invited to work in a bone china factory (Huaguang Bone China Design Group) in Zibo in Shandong province, China, after some of my work was acquired by the Ceramic Museum there. For this exercise, they wanted drawings even though they had seen the real objects. I have had no training in technical drawing, and cannot use CAD programs. I did fairly rough sketches (to scale) of the pieces that I wanted to see produced, and a team of expert model and mould makers made the prototypes out of plaster. Because I was inexperienced in translating a 3-D object into a 2-D drawing, some details of scale and proportion were wrong, and seeing the plaster models enabled these to be corrected. The model makers were quick and accurate, and took only a day or so to make the scaled upmodels. 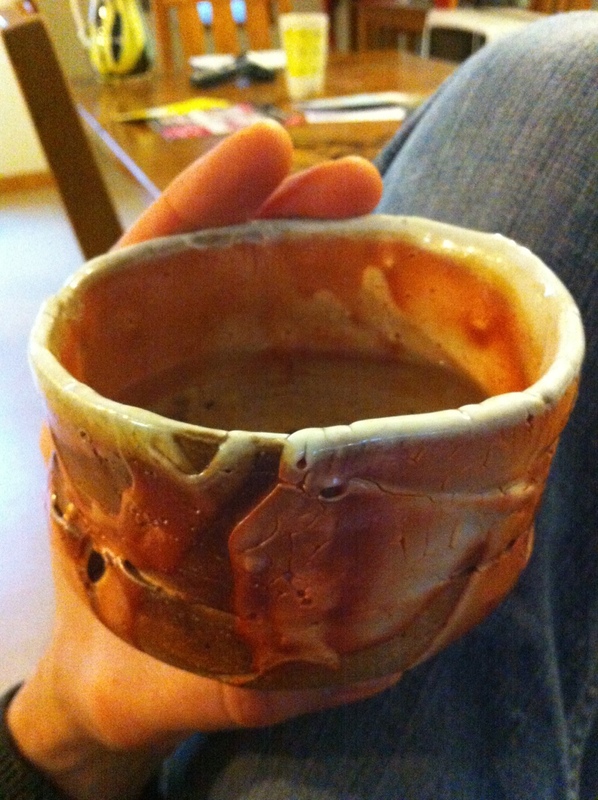 By the time I left Zibo, 9 days later, the first pieces had been cast, fired and finished. There were some small changes to be made, due both to instructions to the factory workers not being made clear, and also to allow for the extreme pyroplasticity of bone china during firing. The following year I received an ANU Arts Faculty Research Grant to enable the Zibo project to go ahead, and also for graduate students to have the opportunity to see their work turned into designs for mass production (something that is almost absent in Australia). Both Lia Tacjnar (MPhil candidate) and Patsy Hely (colleague and PhD candidate) have now also had their designs developed for bone china production. Both need decals made, and these will be completed early this year. domestic market has been designed by Huaguang (and looks very Chinese to me despite its green Southern Cross and Harbour Bridge!). Market-canny, the company is not interested in any export of bone china (‘too competitive’) and is only looking at the Chinese domestic market and the huge emerging middle class who now aspire to own bone china, as porcelain is regarded as ‘very common’. Now there’s a nice irony! Given the urgency with which Europe historically tried to replicate porcelain from China, and the development of English bone china as one such attempt, now the Chinese want quality bone china…it’s exotic, if not Oriental…This teaset won the silver medal in the 2004 Chinese National Tableware Competition. 3. The Huaguang factory still has a lot of ‘hands on’ in the making. As I have always felt that domestic pottery gets ‘remade’ every time it is used, and an idea gets remade every time another cup or teapot or pourer is thrown, this factory ‘act’ doesn’t seem to be too far removed from that in my studio. And of course when it is used there is no difference…? 7. I now know that I am thrilled by repetition…and how repetition somehow ‘grows’ ideas. After leaving China, I had eyes only for repeating patterns. This seemed very close to what I had been talking about in an exhibition Process & Obsession curated by Gillian McCracken in 1995 at the Performance Space in Sydney, and recently (2003) reworked as a smaller work at the ANU School of Art Gallery. 8. Makers seem to make different ceramic designs from those produced by ‘Designers’. There is an understanding of the way materials behave during firing, how a cup will feel in the hand, how liquid leaves a spout which seems to produce more seamlessly functional objects. This is a speculation drawn from a very limited observation of the kinds of designs that had been submitted to Huaguang by European designers that evidenced no understanding of the materials in which they were to be made. This may not be the case in newer materials that do not have to undergo the firing process. Where do we go from here?The next stage of research will be to design (with the help of a CAD-literate colleague) a model and have it made by the Rapid Prototype Unit at the ANU School of Art. This will get the model makers at the factory out of the loop, although they will use the model for making the moulds. I also envisage that more of our graduate students in Ceramics will be involved in the project, and comparisons can be made about the relative success of designs drawn from slipcasting and handbuilding practices as well as wheel-made works. A design stream in the honours year of undergraduate studies could also see students’ designs being developed for production utilising both rapid prototyping and conventional modelmaking.And the conclusions?I don’t know what it all means yet, but I do know that nothing is fixed. Everything changes all the time. We try to stop the present becoming the future at our peril. We try to preserve the past and merely create simulacra. I grew up with the understanding that ‘…if you bring the enemy into your own camp, you will learn about each other and become friends…’. If design and industry are the enemies of studio ceramics, then it is about time that we made friends. Who knows, we might just end up making art. I’ve been working on a few electric cone 9 fired pieces. Exploring my alternatives to the soda kiln while I can. One of my objectives in coming to Arrowmont was to explore or revisit a few new and old processes while here. I had intended to do some work with masked patterns and sandblasting early on but got caught up in routine and was disappointed with a few of the initial tests on my glazes. Solution: use a glaze that you know works well, Thank you Mr. Eric Rempe for leaving your black glaze here at the school. I also wanted to take the time to slow down and put more consideration into compositions on certain forms that just didn’t feel resolved to me (specifically plates). Here are a few images of both explorations. I have a whole kiln load of pieces in the electric cooking right now and will have them shot posted soon. In the meantime most of these mugs are available for purchase on at my Esty shop (Bloomer Pottery). With the all black pieces I had been considering pulling back on all of the glazing and exploring my body of work in a new minimized restrictive way that forced me to address each composition in a new way. I wanted to challenge myself to work strictly in black or white and I think that this is a good start. Other developments in my work not yet fully formed or explored is my relationship to the patterns that I use. Over time the repetitive application of these patterns has allowed them to take on personal meaning to me. There are little stories or personal meaning tied to many of these patterns. I am not sure if I can call the work narrative yet and not all of the patterns have this association but as time goes on I can easily see this correlation between my life and these patterns developing further. The themes associated with these patterns are close to me and my life and frequently are associated with interactions and friendships with others, communicating and interacting with my environment and sometimes even drawing on historic pots, paintings, architecture and textiles of interest or of special affiliation to me. All of these ideas are piled on top of one another, mashed together, much like what I see around me in my life. We find ways to compartmentalize our lives to make them comfortable and manageable. I am still working on that stream of thought. I would also like to take a minute to let you know about two upcoming shows that I have work in. The first is “Emergred: After the Residency” at LilStreet in Chicago which runs March 14th – April 14th. The other is “On the Horizon” at St. Petes Clay in Saint Petersburg Florida which runs from March 1-31st. If you have the chance go check either of them out. There are many great ceramic artists in both and both have a interesting dialogue on residency programs. Just wanted to fill everyone in on what I have been and will be up to over the past few and next couple of months. We (The Arrowmont Artists in Residence) have our show coming up in March and are all putting the nose to the grind stone to get new work made. I have been working on some cone 1 colorant tests which I started two years ago back in Colorado. We have also been working with community classes and kids classes for the last few weeks. The weather has been delivering us some snow from time to time and we have been able to get a little sledding in between studio time. I am working on a few press molded items to add to my portfolio. Its been amazing how quickly I can turn over pieces with press molding. It has been a huge advantage for my tea pot spouts and the butter dishes which I am now making. I have also been pleasantly surprised by the depth and variation I have found simply by using a slip over terracotta and firing it to cone 1. I have some new tray sets in the works which I am excited to included these new pieces in. Other than that I will be moving back to Carbondale Colorado at the end of May to teach at Colorado Mountain College for at least the summer. I am still on the job hunt for a more long term job but am excited to be back in Colorado even if its for a undefined amount of time.